‘No Hoof, No Horse’ is a well-known saying in the horse world, and with good reason. Of course in the sport of driving, the challenge can be multiplied by two, three or four times in an effort to keep a whole team shod and ready to roll. Kate Hore, Senior Nutritionist (R.Nut) for NAF offers advice on how to get hooves into the right condition for competition and beyond. We rely on the hooves to play many roles for our horses, and Mother Nature has created a minor miracle of engineering to do that. The hoof capsule encases bones, tendons, ligaments, a hugely complex matrix of blood vessels and the delicate laminae – all working together to aid propulsion, traction and absorb concussion by acting as a shock absorber. The capsule itself protects these structures and, most importantly, continually regenerates to provide on-going physical support for the body weight of the horse. Hoof size is proportional to the horse’s body size, and a strong hoof, well-shaped and the right size for the horse will evenly distribute body weight across the foot so there are no areas of weakness. It is likely good hooves are inherited, so hoof conformation should be part of any good breeding programme. In the driving world we’re lucky that most of our traditional driving breeds have evolved with strong feet – no doubt, due to the necessity of staying sound over many miles of roads and tracks. Unfortunately, historically, it has not been a high priority in all breeds. Take the Thoroughbred, for example, who is known to have poor hooves as they’ve really only ever been bred for speed – but that is somewhat short-sighted. By also selecting for good hooves, this trait would be reversed and likely result in faster race times through fewer lost training days, better traction and propulsion from the hooves. The same could be applied to any sport from carriage driving to scurry, so good hoof conformation should be an essential part of any breeding selection programme. A horse should naturally grow on average 6 to 10 mm hoof wall monthly; so shoeing every 6 - 8 weeks means there is adequate growth to trim and shape the hoof and put on the new shoe. Slow growth may be due to a number of reasons but the lack of new hoof wall means that new nail holes are too close to the old ones so weakening the wall. In other cases, the rate of growth is fine but quality of horn is poor. Whether slow or poor growth, or a combination of both, the hoof is left cracking, crumbling and prone to having chunks missing out the bottom. 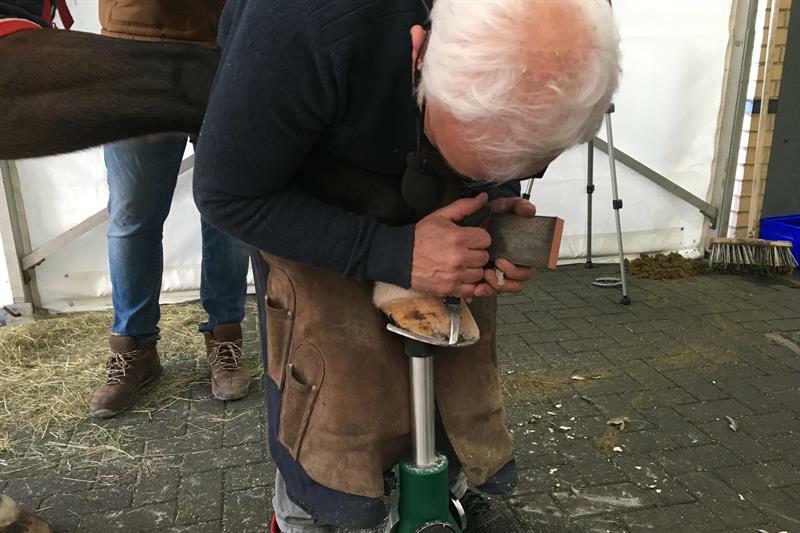 Without healthy growth it becomes difficult for your farrier to manipulate the shape of the hoof for performance, he or she is left just focusing on keeping the new shoe on. Of course, shoeing for performance brings it’s own challenges. Carriage horses may typically wear their shoes out quicker than other disciplines, due to the hard surface on which they typically train and work. A worn shoe will have more movement, think of the tinkering sound out on the road, and will need to be re-shod earlier. It’s not uncommon to re-shoe every 4 weeks through the season. A vicious cycle ensues - the potential for new growth is limited … nail holes are closer together … the hoof is weakened … the need for strong growth is greater than ever. No horse has perfect conformation and we don’t just mean in their hooves. Faults present further up the body often change a horse’s way of going, but research tells us that working with conformational issues rather than trying to correct them will get the best result. For example if a horse is pigeon toed it is likely to wear the outside of the shoe heavily. The remedial farrier will now work with that hoof shape to allow consistent free movement, instead of trying to force a ‘balanced’ hoof. This is likely to produce a sounder horse rather than trying to correct something that is out of our control. Driving on surfaces is ideal for the horses’ joints, if possible, but sand can be very abrasive for the hoof surface. Other factors such as temperature and weather will also have an effect. Though, perhaps, moisture has the greatest influence. Hoof moisture has a direct link to hoof quality and is continually evaporated from the hoof wall, meaning it must be replaced or compensated for. This is done in the first instance internally through the blood and lymph systems which can replenish moisture in the horn cells. However, the wall can also draw moisture from its environment, which depending on what the British weather is doing can be a great help or a hindrance! We will often have glorious sunshine for a week followed by down pours and vice versa. It is this dramatic change in the moisture level in the environment that seems to play havoc with condition of the feet. Due to our changeable weather, experienced farriers believe we should be providing daily external moisture for hooves, reducing effects of those environmental changes that may dry the hoof and lead to cracking. Access to a ford or river crossing on your drive will help, but also consider a daily topical application of a water based moisturiser. It’s no different to you applying a moisturiser to your own hands. On the opposite end of the spectrum excessive moisture like standing in mud through the winter can distort the hoof structure internally and it’s likely this is why we see such a rise in abscesses in winter. Hoof growth, like all systems in the body, can be hugely influenced by the right diet. If we’re putting the right things in we should see good strong growth. Probably the best known nutritional support for hooves is biotin (Vitamin H). Naturally biotin is synthesised in the horse’s own gut through efficient bacterial fermentation of fibre. Therefore horses on high fibre based diets should produce their own biotin requirements. If we see compromised hoof growth, it may be a sign that not enough fibre is being fed, or, that the horse is not absorbing efficiently what is being produced in the gut. This is particularly true of the modern performance horse, who may be on a high cereal diet, or have compromised gut function. In these cases supplementing with biotin to support the body’s own supply, is recommended. If supplementing, ensure the correct level of biotin is being supplied. For driving animals, we would advise 15mg biotin for our native ponies, 30mg per day is ideal for horses such as Cobs, Friesians and Gelderlanders, up to around 45mg per day for larger breeds such as Cleveland Bays and heavy horses. However, just as nothing works alone in nature, targeted nutritional support for hooves should go beyond biotin alone for best results. Look for a supplement which includes good sources of bioavailable sulphur, such as MSM and methionine, as the hoof wall is rich in sulphur. In fact it’s the sulphur that gives hooves that characteristic smell when hot shoeing. Trace elements such as manganese and zinc are also indicated for hoof health, and are a useful addition to any hoof health supplement. Lastly look for support of the whole system. Hooves are part of the ‘dermis’, the largest organ in the body, and therefore the first to show the signs of the physiological stresses of performance training, travel and regular competition. Look for the antioxidant vitamins C and E with herbal support such as rosehip, omicha berries, marine algaes like chlorella and sources of natural fatty acids such as linseed, to ensure that your chosen supplement is supporting all aspects of hoof health for your team. If there is quality growth, from a sound diet and good management, then the farrier can work to stamp out bad feet and maximise performance.